Oxfam made their presence at Copenhagen felt with the arrival of the Big Heads, in conjunction with with the arrival of many national leaders at the COP15 Climate Change summit. 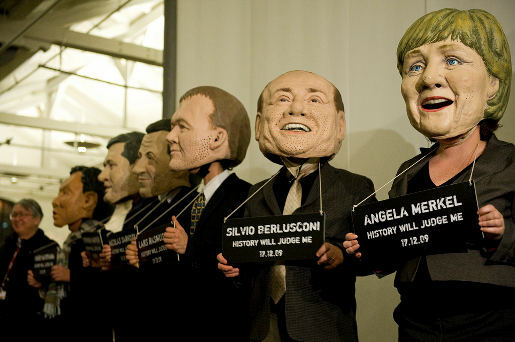 The masked players, last seen playing football at the G20 summit in Pittsburgh, were there to remind world leaders of the importance of negotiating a fair, ambitious, and binding global deal. 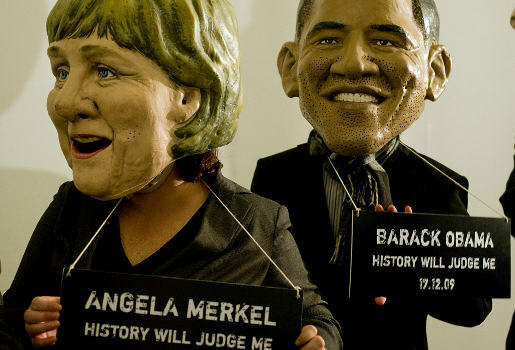 Actors with masks represented leaders such as German Chancellor Angela Merkel and USA President Obama, standing in line to have their mug shots taken. Each held a sign reading “History will judge me”, a reminder that the action or lack of action would carry far-reaching consequences. Photography is (c) Ainhoa Goma/Oxfam International. More photos can be fouond on the Oxfam History Will Judge Me Flickr set.